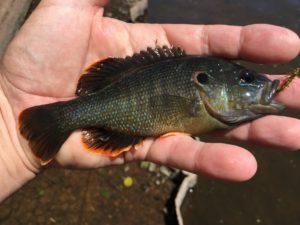 A trip to a small local river added a few species to “The 2018 Fly Fishing List”. The species in the pic above is one of my favorites. As a kid, I incorrectly referred to these as longear sunfish. Looking at the opercular flap, you can see why. It is, of course, the redbreast sunfish. 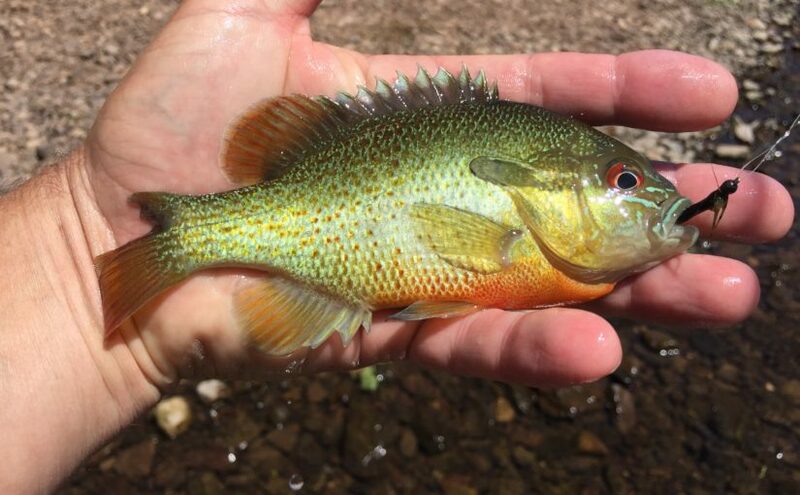 This colorful, willing biter is quite common in this river and many others in the east. This redbreast, and many of his neighbors, ate a fuzzy nymph with a brass bead head. The tail of this specimen is worth mentioning. I would assume that he wore that down digging a spawning bed. The wound looked fully healed and he seemed none the worse for wear. A couple small rock bass came next using the same generic bead head. 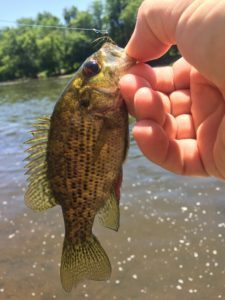 There’s not much to say about a rock bass. They have lots of bite, but not much fight – especially at this size. The green sunfish was the final species of the day. This little guy was the only one of his kind that I found that day. A switch to a glass bead head nymph lead to his capture.